"Howlin' Wolf, Moanin In the Moonlight Box Set (5 CDs)"
HOWLIN WOLF - MOANIN IN THE MOONLIGHT BOX SET - Japanese OBI MINI REPLICA LP TITLES making a 5 CD Box Set- Japanese OBI MINI REPLICA BOX SET Japanese re-mastered Mini LP replica Limited Edition Collection Recorded from the finest Original Masters available. Each title Comes with anti-static sleeves similar to Vinyl LPs, Cardboard packaging exact to the original LP, Re-sealable plastic wrap cases for protection of each collectible Actual miniaturized version of the 12" LP in 4" CD version Special VERY RARE LIMITED EDITION BOX SET ONLY PRODUCED ON FUTURES FOR THIS ONE TIME PRESSING -- were only available in Japan. 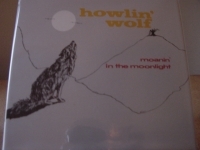 HOWLIN WOLF OBI CD BOX SET WITH THESE TITLES - MOANIN IN THE MOONLIGHT - Track Listings 1. Moanin' at Midnight 2. How Many More Years 3. Smokestack Lightning 4. Baby How Long 5. No Place to Go 6. All Night Boogie (All Night Long) 7. Evil 8. I'm Leaving You 9. Moanin' for My Baby 10. I Asked for Water (She Gave Me Gasoline) 11. Forty-Four 12. Somebody in My Home HOWLIN WOLF - Track Listings 1. Shake for Me 2. Red Rooster 3. You'll Be Mine 4. Who's Been Talkin' 5. Wang-Dang-Doodle 6. Little Baby 7. Spoonful 8. Going Down Slow 9. Down in the Bottom 10. Back Door Man 11. Howlin' for My Baby 12. Tell Me THE REAL FOLK BLUES - 1. Killing Floor 2. Louise 3. Poor Boy 4. Sitting on Top of the World 5. Nature 6. My Country Sugar Mama 7. Tail Dragger 8. Three Hundred Pounds of Joy - Willie Dixon 9. Natchez Burning - Willie Dixon 10. Built for Comfort - Willie Dixon 11. Ooh Baby (Hold Me) 12. Tell Me What I've Done MORE REAL FOLK BLUES - Consisting mainly of Chicago takes from the early to mid 1950s, More Real Folk Blues is titled like a companion to Real Folk Blues but covers a different time period. That's not exactly a bad thing; there's some great stuff on this CD, from the rollicking, almost-off-the-tracks "Just My Kind" to the sensual rocking of "I Have a Little Girl." Sure, the sound quality's not the best, but the loose, relaxed "You Can't Be Beat" and the opening harmonica line on "I Love My Baby" are worth listening for. The highlight of this CD, however, is definitely "I'll Be Around." With its heavy beat and vocals loud enough to overpower everything else, this song has a slow menace that makes it easy to understand how the Wolf could terrify his live audiences. 1. Just My Kind 2. I've Got a Woman 3. Work for Your Money 4. I'll Be Around 5. You Can't Be Beat 6. You Gonna Wreck My Life (No Place to Go) 7. I Love My Baby 8. Neighbors 9. I'm the Wolf 10. Rockin' Daddy 11. Who Will Be Next? 12. I Have a Little Girl THE HOWLIN WOLF ALBUM Track Listings 1. Spoonful 2. Tail Dragger 3. Smokestack Lightning 4. Moanin' at Midnight 5. Built for Comfort 6. Red Rooster 7. Evil 8. Down in the Bottom 9. Three Hundred Pounds of Joy 10. Back Door Man These are Japanese digitally re-mastered Mini LP replica CDs (the OBI Edition). This Limited Edition Collection has only VERY FEW made world-wide and are immediately Out of Print. Recorded from the finest Original Masters available. Comes with anti-static sleeves similar to Vinyl LPs, Cardboard packaging like an LP. Actual miniaturized version of the 12inch LP in 4inch CD version.